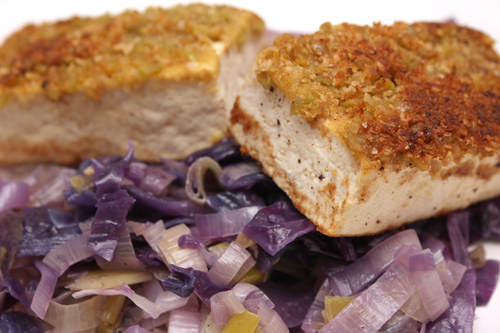 Don’t make the “Wasabi Pea Tofu with Red Cabbage and Leeks,” from the August 2015 issue of Cooking Light, if you’re only attracted to the idea of spicy heat. It’s not here. I’m not angry. I was warned, right? So, let’s talk about how wonderfully the tofu behaves, here. Rewards are in the blotting and dredging and frying. After all that, the tofu is solid, paired with these hearty vegetables. The vegetables! Four leeks require a lot of chopping, a lot of exercise. I went against a certain Cooking Light dogma by adding lots of salt to the vegetables. No apologies. This meal was a hearty one when I sat it atop creamy polenta. I’m clever, that way. Next time, I’ll open the glorious Essentials of Classic Italian Cooking by Marcella Hazan to make two recipes: “Barley Soup in the Style of Trent” and “Baked Stuffed Mushroom Caps” (recipes below). Come back to my site next week, to witness some generous food. Put the barley in a soup pot, add enough water to cover by 3 inches, put a lid on the pot, bring to a slow, but steady simmer, and cook for 1 hour or until barley is fully tender but not mushy. While the barley is cooking, put all the oil and the chopped onion in a small skillet, and turn on the heat to medium. Sauté the onion until it becomes colored a pale gold, and add the chopped ham, cooking it for 2 to 3 minutes and stirring it from time to time. Add the rosemary and parsley, stir thoroughly, and after a minute or less, turn off the heat. Peel both the potato and carrot, rinse in cold water, and dice them fine (they should yield approximately 2/3 cup each). When the barley is done, pour the entire contents of the skillet into the pot, add the diced potato and carrot, the bouillon cube, salt, and several grindings of pepper. Add a little more water if the soup appears to be too dense. It should be neither too thick nor too thin. Cook at a steady simmer for 30 minutes, stirring from time to time. Off-heat, just before serving, swirl the grated cheese into the pot. Serve promptly. A packet of dried porcini mushrooms or, if bought loose, about 1 oz. Put dried mushrooms in 2 cups lukewarm water and let them soak for at least 30 minutes. Put the soft crumb and milk together in a small bowl of deep dish and set aside to soak. Wash the fresh mushrooms rapidly under cold running water, and pat them thoroughly dry with paper towels, taking care not to bruise them. Gently detach the stems without breaking the caps. Line a wire strainer with a paper towel and place it over a small saucepan. Lift the porcini from their soak, but do not discard the liquid. Pour the liquid into the strainer, filtering it through the paper towel into the saucepan. Rinse the reconstituted porcini in several changes of cold water, making sure no grit remains attached to them. Add them to the saucepan and cook, uncovered, over lively heat until all the liquid has boiled away. Chop the cooked reconstituted porcini, the fresh mushroom stems, the pancetta, and anchovy fillets all very fine. It can be done by hand or in a food processor. Put all the above chopped ingredients in a mixing bowl, adding the basil leaves and chopped garlic. take the milk-soaked crumb into your hand, squeeze it gently until lit stops dripping, and add it to the bowl. Break the egg into the bowl. Add the parsley, marjoram, salt, and several grindings of pepper, and thoroughly mix all the ingredients in the bowl with a fork until they are combined into a smooth, homogeneous mixture. Taste and correct for salt and pepper. Stuff the mushroom caps with the mixture from the bowl. Put enough stuffing into each cap to make a rounded mound. Sprinkle the mounds with bread crumbs. Choose a baking dish that will accommodate all the mushroom caps side by side in a single layer. Smear the bottom and sides of the dish with a little of the olive oil. Put the mushrooms in the dish, stuffed sides facing up. Crisscross the mushrooms with a thin stream of olive oil, lightly daubing the stuffing. Place the dish in the uppermost level of the preheated oven and bake for 30 minutes, or until the mounds of stuffing have formed a light crust. After removing from the oven, allow them to settle for several minutes before serving.